If you thought sunken treasure was only found in fairy tales, think again. Two divers recently found a trove of well-preserved artifacts off the Israeli coast. 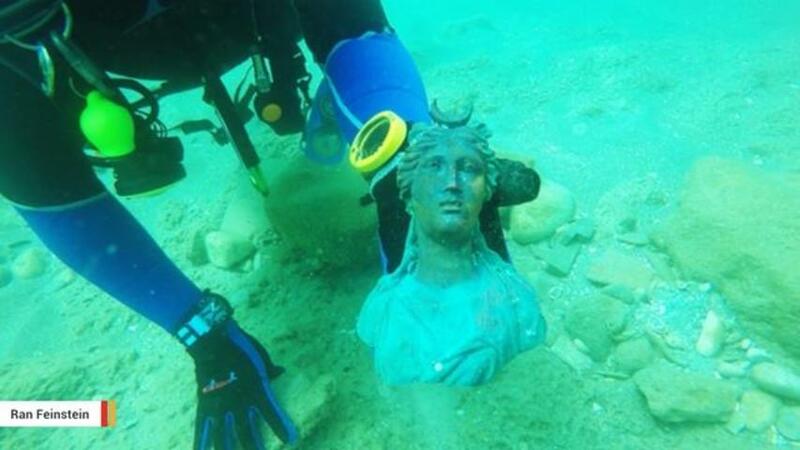 During a recent diving session, the hobbyists turned up ancient statues, coins, a bronze lamp, ship anchors and other sailing tools, according to the Israeli Antiquities Authority. The sand-preserved booty is believed to hail from a cargo ship that wrecked 1,600 years ago. Coins found amid the rubble bear the images of Western Roman Emperor Constantine and his rival Licinius, who ruled the eastern part of the Roman Empire, according to the IAA. That means the relics could come from a time when Constantine had not yet taken over the entire Roman Empire and ushered in a wave of Christianity over the region. "The location and distribution of the ancient finds on the seabed indicate that a large merchant ship was carrying a cargo of metal slated recycling, which apparently encountered a storm at the entrance to the harbor and drifted until it smashed into the seawall and the rocks," IAA director of marine archaeology Jacob Sharvit and deputy director Dror Planer said in a statement. "A marine assemblage such as this has not been found in Israel in the past 30 years. Metal statues are rare archaeological finds because they were always melted down and recycled in antiquity." Ultimately the IAA plans to showcase its latest findings to the general public, as it did last year with a block of gold coinsthat were also found underwater.